In the metal manufacturing process, it is considered that ultrasound technology can be applied in the promotion of solid dissolution such as lime dissolution to molten slag and solid metal addition to molten alloy. Generally, in the high-temperature reaction process, mass transfer has a large effect on the rate of reaction in isothermal conditions. In order to facilitate mass transfer, it is necessary to strengthen the agitation of the bath. However, it is impossible to avoid the erosion of the stirrer and container. Enhancement of stirring promotes mass transfer. This corresponds to thinning of the boundary layer thickness in the boundary layer theory. To further accelerate mass transfer, a new method of thinning the boundary layer of the solid surface without using mechanical stirring is needed. 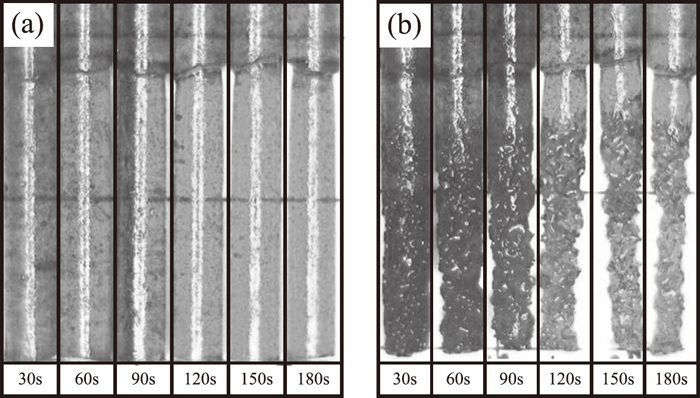 In this study, the effect of ultrasound on the dissolution phenomena of solid in liquid was investigated by using a sucrose-water system. Applying ultrasound to a liquid induces ultrasonic radiation pressure, acoustic streaming and various nonlinear phenomena of cavitation. Especially, when the cavitation bubble collapses, a micro jet is generated and a strong flow occurs locally. It was thought that this micro jet collided with the solid sample and the surface became uneven. If the cavitation phenomena occur at the solid surface, it is possible to disturb the boundary layer and increase the mass transfer rate by thinning the boundary layer. It was found that the cavitation in the vicinity of the solid surface at the low ultrasound frequency caused a disturbance of the boundary layer of the solid surface and promoted dissolution rate of the solid.